Indotechboy — I think PPSSPP today has become the most popular game emulator in the world. Tip: Search PPSSPP. PPSSPP is an emulator software that allowed us to play Playstation Portable (PSP) game on our device. Open source, free, it's stability, available on every Operating System (OS), is the main reason why it's just simply the best emulator program / application out there. Just as an emulator, PPSSPP is tweaked with many features that doesn't exist on the original PSP console, one of it is Cheat option. The cheat program used on PSP / PPSSPP is called Cwcheat. And on this post, we will learn how to use CWcheat on PPSSPP emulator. CwCheats is the trully first ever cheat engine on PSP platform. It works like Gameshark or Action Replay, and it is originally released for the Real Playstation Portable console as external plugin. Since I never had my own PSP :v , now I just will share about how to use CwCheats to enable cheats on PSP games with PSP emulator like PPSSPP. Because the user interface of PPSSPP emulator is almost the same on any OS, so I think this tutorial is applicable across devices from Android, iOS, to PC. The CWCheats database contains thousands of PSP games cheats. Note that not all game will available in the cheat database. But it's about of 80% PSP ROM game I have is available to be cheated. Well me myself is actually don't often use cheats on games. It will less your fun and satisfaction when you are completing the game, you know :D ? But PSP is console game that really-really made only for gaming purposes (different like Android games). We will find more secrets, difficulty, obstacle, and more time to spend to completing a PSP game title. So if you feel want to die because of a game, I think cheats is allright sometime :D (for offline gaming though). Make sure you are using updated version of PPSSPP emulator to avoid any unexpected bugs possibilities. Download the Cheat database.zip file, and extract it. 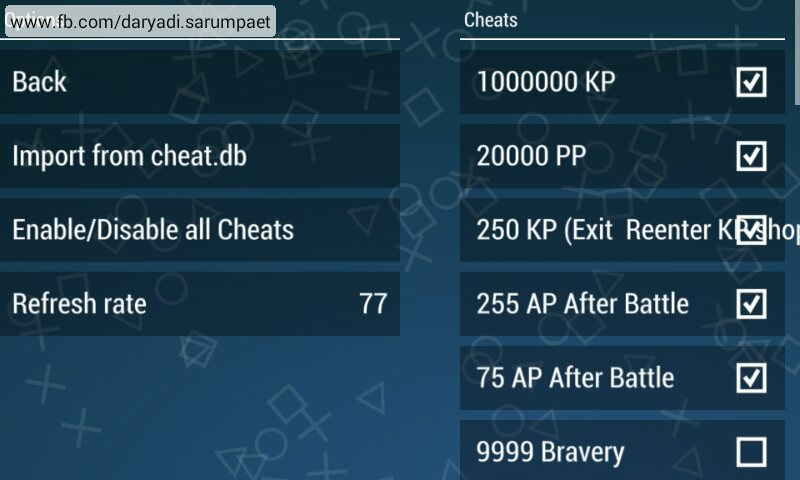 Copy the "cheat.db" file to directory SdCard/PSP/Cheats if you are on Android, if you are using other operating system then you can search the equal directory (For example on: Documents:\PPSSPP\PSP\Cheats if you are using PPSSPP installer on Windows). If the Cheats folder is not exist inside the /PSP folder, then create it by yourself. 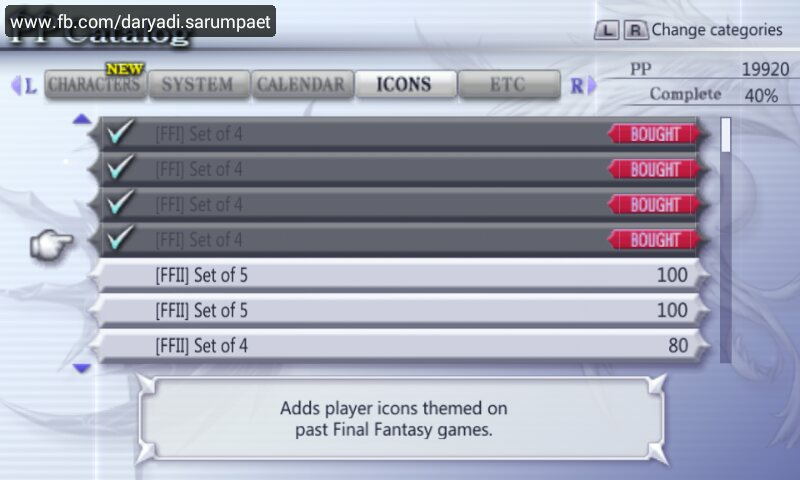 Play your game, then press the back (menu) button to enter PPSSPP menu. Go to "Settings (Game setting)" -> "System", scroll down to search and tick the "Enable cheats". Go back, after that it will appear "Cheats" option on the PPSSPP menu, if not, then try restart the game. 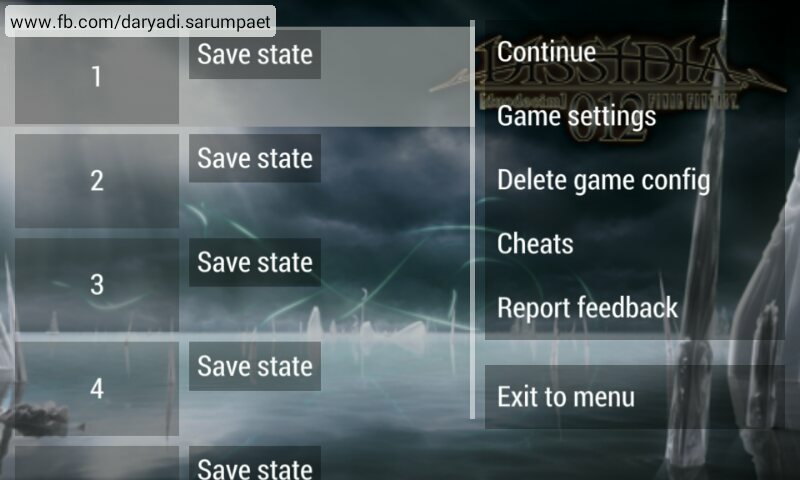 On the PPSSPP menu, choose "Cheats" option -> "Import from cheat.db". Back to your game for a few seconds to refresh the cheat codes, then back to Cheats menu again. Cheats code selection should be appears now, if it not appears try to restart the game first. If after restarting the game the cheats selection is not appears yet, then maybe the game is not available in the CWcheat database. Just tick the cheat you want to activate and cheat it!. Be aware to always make ingame save. Because most of the cheats effect may will not gone away if you load your game through save state, even after you restart the PPSSPP. Comments (9) in "How to Use Cheats on PPSSPP PSP Emulator"
the download is apk file? Not zip only file? If by any chance you have tried it, does this database also contain cheats for Patapon 3? I tried to inspect the it using my Text editor, and Yes Patapon 3 cheats for region JP, EU, and US is included. Thanks! Finally a download link without all the bullsh*t of the url shorteners and safelink redirecting!